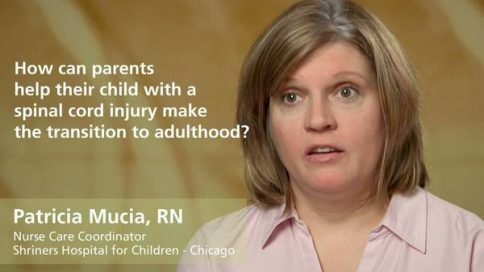 Patricia Mucia has worked at Chicago’s Shriners Hospitals for Children for over 20 years in a variety of roles. A certified rehabilitation specialist, Mucia has experience in the Pediatric Intensive Care Unit, as an inpatient nurse, an outpatient nurse, a nurse team leader, and most recently, as Nurse Care Coordinator. 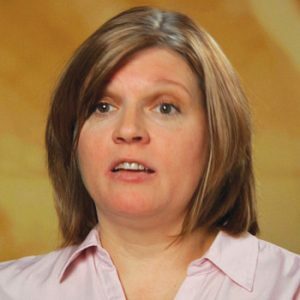 She plays a leadership role on Shriners’ multi-disciplinary teams, helping families to ease the transition from the hospital programs to home and school and to adulthood. What’s the most important thing for parents to do after a child is diagnosed with a spinal cord injury? How are children’s spinal cord injuries different from adults’? Why does a child need a specialized rehabilitation program? What’s important to consider in choosing a rehabilitation program for a child? How do spinal cord injuries to children affect their physical development? How do spinal cord injuries to teenagers affect their physical development? How do rehabilitation programs change as a child grows older? Why is it important for children with spinal cord injuries to set their own rehabilitation goals? What can parents do to encourage their child’s rehabilitation progress? What can do parents to ease the transition from hospital to home? When should a child with a spinal cord injury return to school? How can parents help their young child with a spinal cord injury get play experience? How can parents help children with spinal cord injuries participate in social activities? Why should parents advocate for their child with a disability? When should a child transfer to an adult rehabilitation program? How can parents help their child with a spinal cord injury make the transition to adulthood? Do children with spinal cord injuries grow up to marry and raise families? What’s the most important thing for parents of children with spinal cord injuries to know?